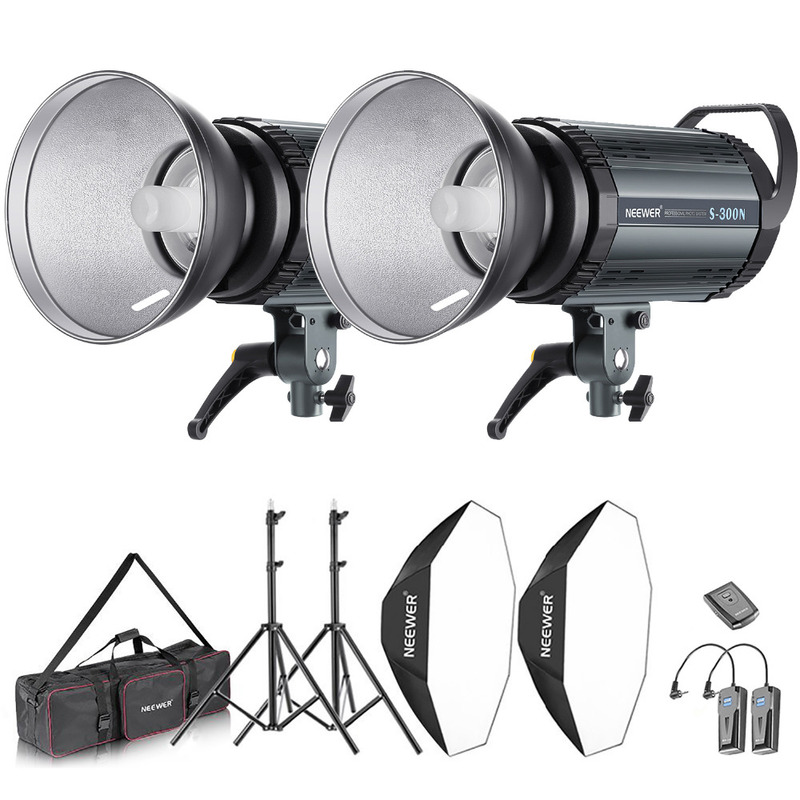 The kit includes:(4)79"(7 Feet)/200cm Light Stand+(2)Single Head Light Holder+(4)45W CFL Daylight Bulb +(2)33"/84cm Umbrella+(2)24"x24"/60x60cm Softbox+(1)1.8 x 2.8M/6 x 9 ft Musline Backdrop (Black,White and Green) +(6)Backdrop Clamps+(1)2.6M x 3M/8.5ft x 10ft Background Stand Support System+(1)Carry Bag for Background Support System+(1)Carry bag for Continuous Lighting Kit. (4)79"(7 Feet)/200cm Light Stand:Solid safety 3 legs stages,capable for stable,heavy duty work.And use quick single action locks,providing fast precision height adjustment. (2)The single head light holder allows you to attach a bulb to a light stand and add an umbrella. (2)The 33"/84cm white translucent umbrella can soften,broaden and diffuse the light output of any tungsten or studio flash source. (4)45W day-light studio light bulbs:equals to 200W regular incandescent light bulb output.5500K fluorescent spiral bulb generates a close match to natural daylight and a crisper view of the items being illuminated.It is best for photography lighting. (2)24"X24"/60x60cm Softbox:Softbox diffuses the light and gives you perfect even lighting when you need for the best shots possible.With E27 socket,you can directly connect light bulbs,fluorescent lamps,or slave flash to offer the light. (1)1.8 x 2.8M/6 x 9 ft Musline Backdrop(Black,White and Green)+(6)Backdrop Clamps+(1)2.6M x 3M/8.5ft x 10ft Background Support System:The background kit is ideal for television,video production and digital photography. (1)Continuous lighting kit carry case+(1)Background support system carry bag:Great for transporting light stands,umbrellas,and other accessories. The light stand is constructed from aluminum alloy,giving it exceptional strength for heavy duty work. For simple storage and transport,the stand collapses easily and is very lightweight to carry. Made of high impact plastic and aluminum.Support heavy weight and hold up against tough working conditions. Insert fluorescent spiral bulb and umbrella and adjust your mount so it is at an optimum angle for getting great photographic results. Made of high quality nylon construction.Reflect and spread light stream evenly. Adjustable lamp holder for different shooting angles. A white front cover closes the front of the softbox,making varied lighting options quick and easy. Made from aluminum alloy with a professional black satin finish. Crossbar consists of four sections,making it simple to adjust the width. With carrying bag,custom designed for background support kit and photography accessories.